UK-Elect General Election Forecast, February 4 2015. 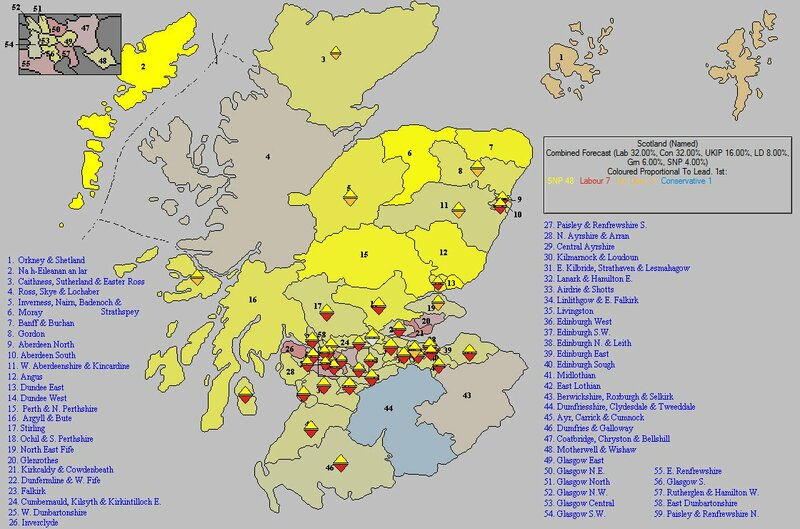 This month the Scottish National Party is again forecast to have a key role after the next UK General Election - but the 48 seats forecast for the SNP, a little down on the more than 50 seats suggested by previous UK-Elect forecasts, would not quite be sufficient to give an Labour/SNP alliance an overall majority. In fact, in theory, the result forecast would leave any Labour/SNP alliance needing to secure the support of two other MPs to obtain an overall majority. Of course, in reality any result similar to that forecast would put the SNP in a very strong position to choose who governs Britain. Taken together with the rise of the UK Independence Party and the fall in Liberal Democrat support in the polls, there can be little doubt that British politics is going through one of its most fascinating periods ever. The GB percentages used for this forecast were Lab 32%, Con 32%, UKIP 16%, Lib Dem 8%, Green 7%. 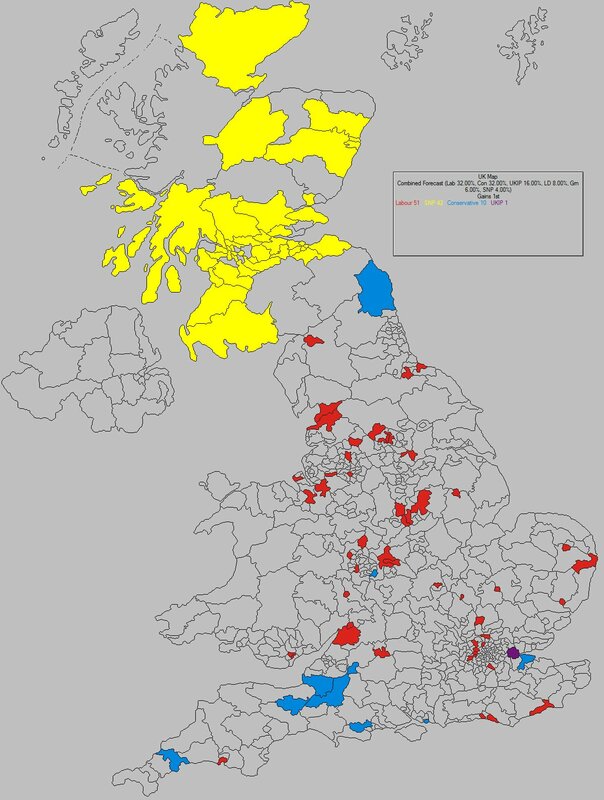 For Scotland the percentages used were SNP 43%, Lab 26%, Con 14%, Lib Dem 6%, UKIP 6%, Green 4%, for Wales the percentages used were Lab 37% Con 23% UKIP 16% Plaid Cymru 10% Green 7% Lib Dem 6%, and for London the percentages used were Lab 42% Con 32% UKIP 10% Green 8% Lib Dem 7% Other parties votes were not specifically set. (If you prefer to forecast using alternative forecasting methods, your own percentages, the current opinion polls, using tactical voting, or even using different electoral systems, browse the UK-Elect on-line shop. 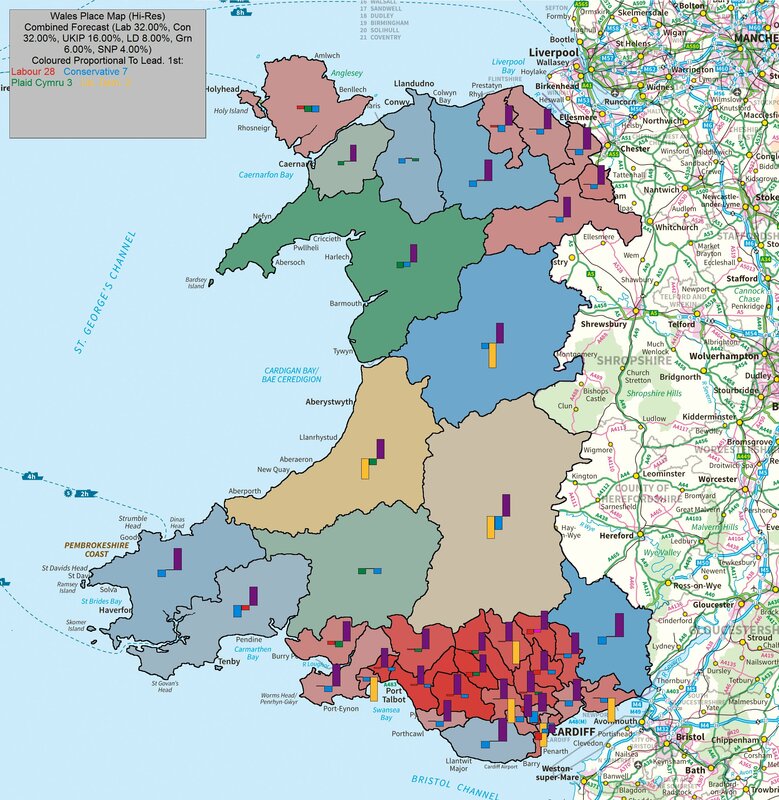 UK-Elect v9.2 is already proving a hit with MPs, academics and newspaper editors - why not try it yourself: "UK Elect 9.2 is a superb piece of software. I love its advanced, flexible and sophisticated functionality. 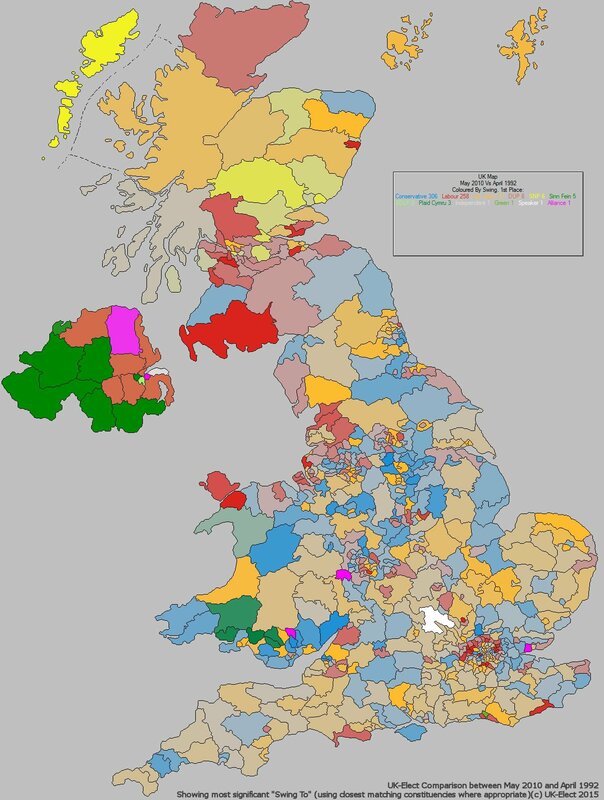 It is, for me, seriously addictive.."
Note: for political campaign analysis maps showing in which constituencies the parties are currently doing better or worse than would be expected by current opinion polls, see the UK-Elect maps page. Notes: The forecast base was the 2010 General Election, although gains are compared with the current situation (at February 2nd 2015). 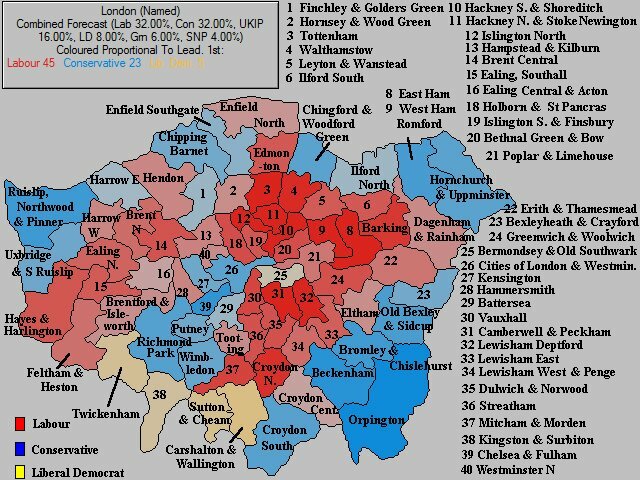 The UK-Elect v9.2 forecasting method was used. 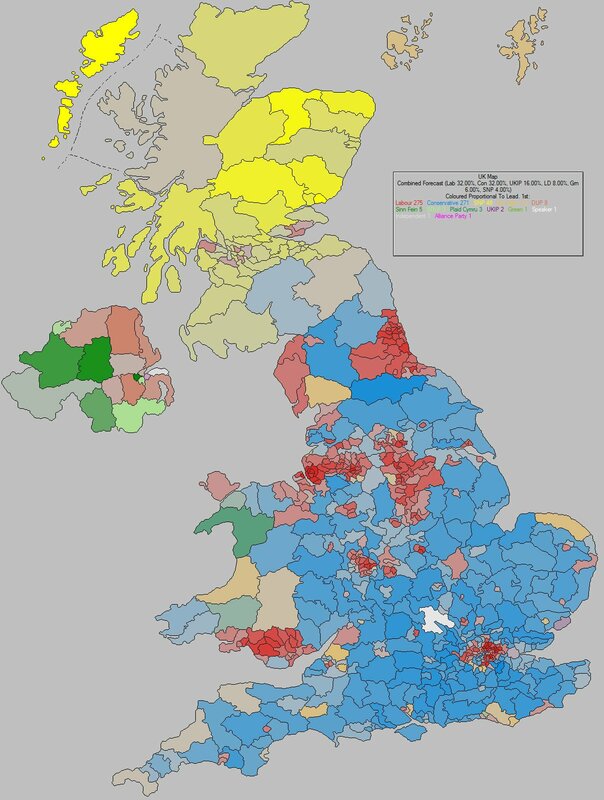 This is based on Uniform National Swing, but the forecast was made on a separate regional basis for Scotland, Wales, London, and Great Britain, with many other factors taken into consideration, including by-election results, local constituency opinion polls, tactical voting, and enhanced support for incumbent parties. Options to compensate for some of the oddities of UNS were also set - e.g. to prevent the forecasting of negative vote totals. Multiple iterations were used to achieve the correct target percentages. UK-Elect v9.2 users can reproduce the above forecast by doing a UK-Elect v9.2 "Guided Forecast" and specifying the separate percentages for Scotland, Wales, London and the overall GB percentages. Note that additional tactical voting and incumbency support was NOT enabled, but that UK-Elect v9.2 method includes built-in support for incumbency in any case.